Scott is a graduate from Springfield College, where he completed his doctorate of physical therapy degree. He has had clinical experience in multiple different outpatient and inpatient settings which assists with treating a wide variety of age ranges and conditions. Scott has continued interest in the latest physical therapy research to improve his treatment effectiveness. 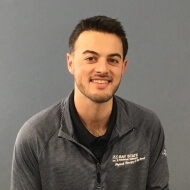 Scott is from Bristol, Rhode Island and enjoys basketball, soccer, and many different individual seasonal sports in his free time.